Designing a monument is an art form and something we take great pride in. For many years, our family has designed and built granite headstones, monuments, and mausoleums in cemeteries across the country. The design work is done locally in our offices in Louisville, Kentucky. The finished cemetery monuments are then shipped to their destinations throughout the country. We understand the importance of family, and we work to create unique memorials that are not only pleasing to the eye but that lovingly tell stories in stone. A properly designed monument or grave marker reflects something of the life, the personality and the contributions of the person for whom it was built. In our eyes, every person who has lived has value and deserves to be remembered with a beautiful monument. Whether a monument is destined for a local cemetery or if it is being shipped two thousand miles away, it receives the same attention as a memorial headstone would receive if it were being built for a member of our own family. In 2017, we proudly partnered with Emmett A. "Tony" Ratterman Jr. of J.B. Ratterman & Sons and became a licensed funeral home. 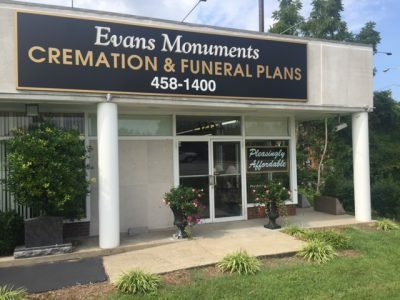 In addition to monuments, we now offer traditional funeral services as well as very inexpensive cremation options. In years past, J.B. Ratterman, Sr., as part of the extended Ratterman family, became the ultimate provider of funeral services in the Louisville area. With Tony Ratterman now being a part of our staff and directing our funeral and cremations operation, we are able to provide the same caring service and attention to detail for prices that are affordable. If you live in the local Louisville area, we invite you to stop by our office at 3204 Bardstown Road at the Watterson Expressway. If you live outside the local area, you may contact us by e-mail or by telephone, at (502) 458-1400.